Many players come and go so quickly on the Internet, it is no surprise that unfinished games can happen. The developers of GammonSite are also aware of the “dropper” problems that exist in the Internet gaming community. After much consideration, we have decided on the following 5 features to prevent players from having too many unfinished matches and hopefully, discourage players from displaying a “bad-sportsmanship” attitude by dropping their matches. 2. Matches stopped in a position where either of the players has more than 97.5% chances to win. These matches are removed within 15 minutes and the elo modified. 3. Dropper Stopper forces players with more than 5 unfinished matches to play a move in each of the games where it is his/her turn to play before being allowed to start a new match. 4. Dropper Stopper also prevents players with 15 or more unfinished matches from starting any new games until they reduce the number of unfinished matches to under 15. 5. The Match Controls feature allows an easy and effective way to resolve unfinished matches by reaching an agreement with your opponent. On GammonSite the games not resumed after 10 days are automatically removed from the server. eXtreme Gammon analyzes the position and from this analysis the elo points are awarded. 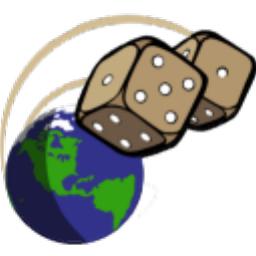 If the dice are rolled, then eXtreme plays the best move for the player. 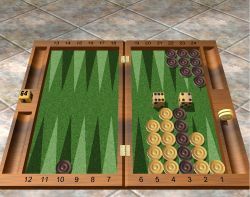 eXtreme Gammon analyzes the position and gives the chances to win a single game, a gammon and a backgammon for both players. By adding the different probabilities for each event we have the entire match winning chances for each player. Knowing the elo of both players, we can determine how many points they will win or lose for a victory or a defeat. Using the Match equity, we compute how many points are awarded to each player. Both players will be notified by a mail in GammonSite when a game is removed. 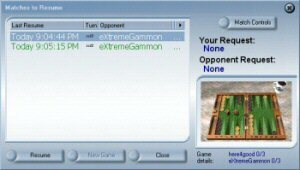 When either of the players disconnects or leaves the current game, eXtreme Gammon immediately analyzes the position. If the analysis shows that either of the players has more than 98.5% chance to win the entire match, then the game is immediately deleted and the players get the elo points for winning and loosing the match. eXtreme Gammon analysis says that White winning chances in the match are 99.8%, thus the game is awarded to White without him having to wait 10 days. Note : If the score would have been 0-0, the game would not have been removed. After the current game is over, the score will probably be 2-0. Red now has about 24.7% chance to recover from this score. If you have 5 or more unfinished matches and it is your turn to play, you will not be permitted to start any new games until you played your move in all "Forced Move" matches. The green check mark next to your opponent's name indicates that it is your turn to play. You always make one move in such games, whether your opponent is connected or not. The games "Adjourned" by mutual agreement are excluded from the "Forced Move" rule. You are always permitted to resume any match, regardless of the "Forced Move" rule. A player with 15 or more unfinished matches can not start any new games until he reduces his number of unfinished matches to under 15. This feature offers you an easy and effective way to resolve unfinished matches by reaching an agreement with your opponent. Click the Resume button then Match Controls button. Request Cancel will send a request to your opponent asking to cancel the match. If your opponent accepts, the match is deleted. 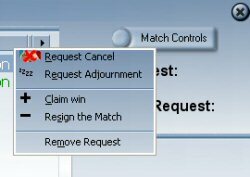 Request Adjournment will send a request to your opponent asking that the match be finished leisurely without any "Forced Move" rules. Claim Win asks your opponent to acknowledge your win of the game. Resign the Match will immediately end the match, resulting in a loss for you. "Request Cancel" of a non-rated game will result in its immediate removal. A tournament or league game can not be canceled even with both players' agreement.